The Literal Ultima, a section of The Notable Ultima, contains the Ultima V Signs. Ultima 5 inaccuracies [English | German] can be found at Hacki's Ultima Page [English | German]. There is an essay about the Shadowlords on the Other Codex (Internet Archive). You can find a lot of information about the Shadowlords and how to destroy them at the Ultima V section of Silva's World (via the Internet Archive). You can find another Ultima V Transcript at the Literal Ultima, a section of the Notable Ultima. A whole lot of information about party members can be found at Ultima Thule. See the Ultima V Section of The Collectible Ultima (which in turn is a section of The Notable Ultima) for the various Ultima V releases. Ultima V Section on the Ultima Web Archive has maps of Britannia and the Underworld with information, help on solving Ultima V with just an outline with what is to be done, and documentation including Lord British's Underworld Adventure and Encore Documentation. 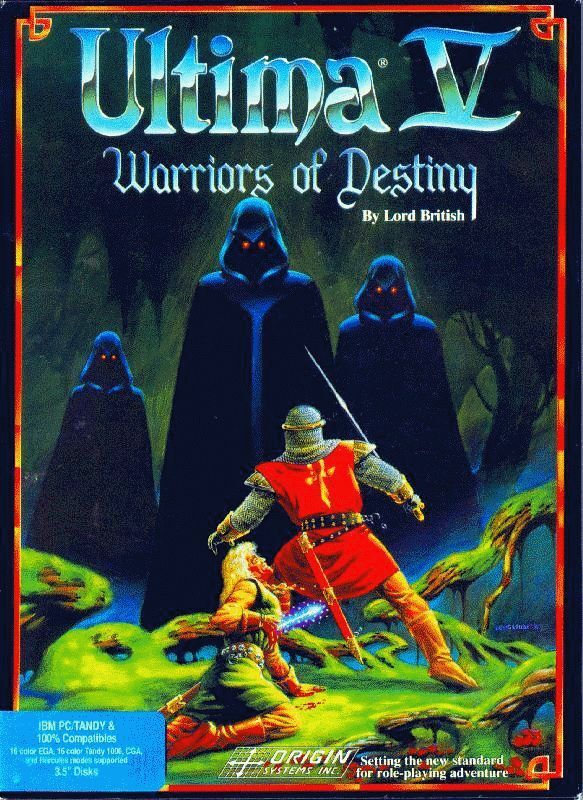 Lord British's Underworld Adventure, part of the Ultima Web Archive, describes the capture of Lord British by the Shadowlords, and is useful in locating the Amulet in the Underworld. The Ultima V Encore CD-ROM Manual, also part of the Ultima Web Archive, shows how to play Ultima V.
You can learn how to know your karma on the Other Codex (Internet Archive). Micro Dragon's Ultima Documentation can be found at the Other Codex (Internet Archive). Pictures of the documentation can be seen or downloaded from the Ultima 5 Section of Virtues Dragon's Codex of Ultimate Wisdom (via Bootstrike). A text version of the Ultima 5 Reference Card is available. Marc Winterrowd's Ultima Tech Info and Patches contains a patch for Ultima 5 which changes runic text into normal text, so that it's no longer necessary to translate the runes. You can find Blackthorn's virtues at the Ultima V section of Silva's World (via the Internet Archive). On Gargish Dragon's Ultima Page, you can read about the Save Game File Format. There is also technical information for Ultima 5 (among other Ultimas) at Nodling's Ultima Tech Info and Patches. The magical harpischord at the top of Lord British's castle can not only make walls disappear, but also transform objects. psych0naut uploaded a video on YouTube to demonstrate this. Chris Roberts, one of the developers at Origin, has an in-game character named after him. In West Brittany is a farmer called Christopher, who his co-worker Phillip calls Dibbs. Lord British, as always, is the in-game character for Richard Garriott. The companions also have real-life counterparts. More info: The Avatar and his companions at Wikipedia. The companions Gorn and Seggallion come from other Origin games. They first appear in the Ultima series in Ultima 5, but reappear in later games. Ultima 5 features several items hidden in odd parts of town such as tree stumps. There are also other items hidden in key locations on the world map or in the underworld. Apart from hidden items, there are also secret doors (marked by a dot), rooms hidden behind fireplaces, and areas hidden behind mountains (reachable only via either the grappling hook or the Blink spell) to discover. Using bad language while talking to people makes them react with a particular response. There is a town or castle where you can obtain a horse by dropping a coin in a well and wishing for one. There are at least three talking creatures in the game: Smith the Horse at Iolo's Hut, Balinor the Daemon at Stonegate, and Sin'Vraal the Daemon somewhere in the Dry Lands. Smith the Horse gives you a hint for Ultima 4 - an easter egg that became a tradition to be included in every Ultima game from then on. wrh2005 made a Civilization 2 scenario based on Ultima 5. In the thread are some attached screenshots. The download link no longer works though. Magically locked doors can be opened either using a skull key, casting the magic unlock spell, or by blowing them up with a cannon. One of the potential companions is a character named Saduj, which is actually Judas backwards. The character is a Biblical parallel in that he also betrays you. The Cutting Room Floor's Ultima 5 (Apple II) page describes two easter eggs available in Ultima 5 on that platform: Toshi Morita, and FLIPFLOP. More fun info and things to do can be found at MobyGames' Game Trivia for Ultima 5. The Encore CD-ROM Documentation on the Ultima Web Archive has information about gameplay and controls. A summary of commands can be found on the Quick Reference Card [GIF] at Trigon Dragon's Ultima V Dox (thanks to the Internet Archive). Paulon Dragon has written an essay about Lord British's artifacts, or the Crown Jewels, and it is on the Other Codex (Internet Archive). There is a list of Ultima V Prices at Ultima Thule. There is an items section in the Ultima V walkthrough by Jacky Swallia, (originally available at Iolo's Lute, but now hosted here at Dino's Ultima Page). The Ultima 5 Reference Card contains all the weapon and armour ratings. The Other Codex has the three undocumented spells (Internet Archive). Half of the Ultima V Encore CD-ROM Documentation, found on the Ultima Web Archive, is about magic. The Ultima 5 Reference Card contains info about all the spells. "This map was originally scanned by Trigon Dragon. I've touched up the colors, and have replaced all the original fuzzy runic text with the Ultima Runes true type font. Because of the overwhelming darkness of the whole map, and the stark, contrasting colors, I had to put a white "halo" around the text to make it readable. "The moon phase markers were quite fuzzy, so again they were replaced with computer generate moons." Here at The Other Codex (Internet Archive). At the Ultima V section of Blackshadow Dragon's Ultima Warehouse (thanks to the Internet Archive). Small and Large here at Dino's Ultima Page. The Britannia Maps in the Ultima Web Archive are very useful; there are two maps there. The Underworld Map and Info in the Ultima Web Archive has an incomplete map of the underworld, though featuring all the essential places, and also essential Underworld information with it. Though there are spoilers. Xenerkes Dragon's Ultimatrix Homepage (mirror), on the other hand, has complete Ultima V Maps taken with Ultimatrix. There is an essay about the Shrines on the Other Codex (Internet Archive). There are maps of the Underworld and Dungeons on Dungeons of Destiny (thanks to the Internet Archive). Otmar Lendl's Ultima maps used to have some kind of Ultima V Mapping Program - you can still check it out thanks to the Internet Archive. Visit HRUMP for the nicest maps on the web, available even in different sizes. Yet another Ultima V Britannia map is on Auric's Ultima Moongates. Ynnad Dragon's Ultima Home Page (Internet Archive version) had a hand-drawn (with Corel Draw 8) large map of Britannia, as well as a computer-generated map of the Underworld created using Yragael Dragon's Ultima Map Viewer. The CorelDraw version of the Britannia map [ZIP] has survived and is being hosted here, while the BMP format is lost. I am also hosting a copy of the Underworld map [ZIP] which is in bitmap format. MagerValp had computer-generated maps (Internet Archive link) of Britannia and the Underworld, now hosted here. David Randall pointed out Andrew Schultz' Ultima V Detail maps, containing maps for all internal locations (towns, castles, lighthouses, etc). There's an interactive Ultima IV/V Map Explorer, where you can roam around the map and easily switch between the Ultima 4 map as well as the Ultima 5 overworld and underworld. 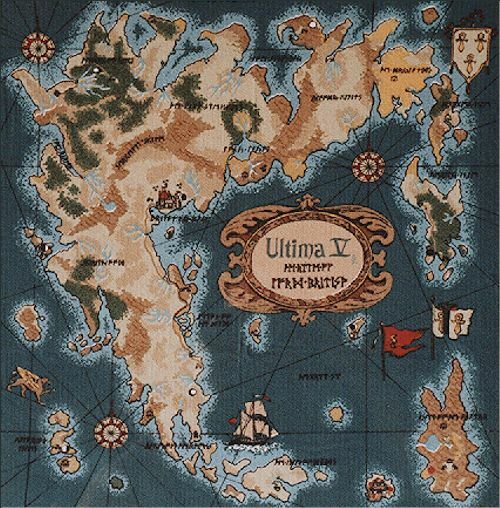 3dh created labelled Ultima 5 maps (overworld / underworld; 4096x4096px). Use Ctrl+F for quick search, hover over locations for brief details, and click to visit the relevant page at The Codex of Ultima Wisdom. Mysterious Sosaria has lots of Ultima V Music, and you can download music one by one or in one zip file. The Ultima V Section of The Collectible Ultima, a section of The Notable Ultima, contains pictures of the box covers of all the Ultima V releases. See the box cover at Auric's Ultima Moongates. There is an Ultima V Encyclopaedia Britannia on the Other Codex (Internet Archive). Ultima V: Lazarus, the remake of Ultima V using the Dungeon Siege engine led by Tiberius Moongazer, had released their first alpha demo on 2nd February 2004. None of the download mirrors are still available. Lazarus released a second alpha demo on 9th June 2004, but all download mirrors seem to have disappeared. Lazarus' final v. 1.20 release can be downloaded from any of the mirrors listed on their downloads page, or from the relevant project entry at The Ultima Codex. Nazghul was a game engine resembling the Ultima 5 engine, and its goal was to do what the U5 engine can, and better. The actual game was in no way related to Ultima - the only connection to Ultima is the engine being based on that of Ultima 5. Nu5 is to be an Exult-inspired engine for Ultima 5. The Ultima V Section of The Collectible Ultima, a section of The Notable Ultima, contains a short review of the game. Read the plot at the Ultima V page of Auric's Ultima Moongates. Read about Ultima 5 at "CRPG History Abridged - 21 RPGs that brought something new to the table", by Felipe Pepe for Gamasutra (25th June 2015). Ultima 5's impact is covered in "30 Years Later: Taking A Look At Ultima 5's Legacy", written by Tyler Treese on 5th October 2018 for Game Revolution. There is a Doom walkthrough on the Other Codex (Internet Archive). The Other Codex also has solutions to common Ultima 5 problems (Internet Archive). My Ultima V Quests gives every detail about the Shrines' quests in Ultima V.
A walkthrough by Ashen Shugar (Internet Archive link) has decent directions on getting through Dungeon Doom. A video of the endgame by psych0naut is available on YouTube. There is a walkthrough by Palador at GameFAQs. An Ultima V walkthrough by Jacky Swallia [TXT] from 2001 used to be available at Iolo's Lute. Since the site no longer exists, I am now hosting this walkthrough here at Dino's Ultima Page.